Welcome to the Sea Palm vacation rentals in Fort Walton Beach, Florida. 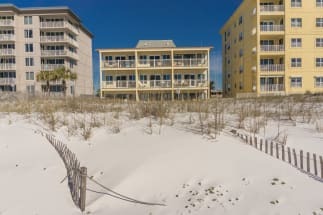 This small condo complex is a wonderful place to spend an Emerald Coast vacation. The complex offers a pool and grilling area. Take a short stroll down to the beach and enjoy the white sugary sand of the Gulf Coast. This complex is between the Santa Rosa Mall and Okaloosa island, offering guests endless activities. Some of the favorite restaurants in the area include The Crab Trap at The Boardwalk, Tijuana Flats, and STEWBY’S Seafood Shanty. You will have a great vacation staying at Sea Palm in Fort Walton Beach! Book your next trip to Sea Palm with Emerald Coast By Owner. Our site puts you in direct contact with the owner and does not charge any service fees. We hope you enjoy your trip to the Emerald Coast.